Does the Moon have a night and day like Earth? When sitting on the Moon and viewing the Earth what does it look like when the Earth goes through phases like the Lunar Phase? How does the sun travel through the Moon's sky facing the Earth like this gif? Part of my question was a duplicate so I deleted it and posted the other link below. How bright is the full Earth during the lunar midnight? The Earth-Moon System is a system where the moon is tidally locked to the planet, but the planet is not tidally locked to the moon. Earth has a 24 hour day, whereas the Moon has a 29.5 Earth day long day. It takes the Moon 29.5 Earth days to orbit around the Earth once as well, which means the Moon is tidally locked in a 1:1 ratio. This means that if you were to stand on a particular point on the Moon, the Earth would not appear to move because the Moon is spinning on its axis at a rate such that it matches how much the Earth should appear to move from orbiting around it. Basically, the same side of the moon is always facing the Earth, which is why there is a concept of a "dark" side of the moon. The "dark" side is not always actually dark, it's just that no one had ever seen it before until we sent some satellites up there to look at it. Here is a gif showing tidal locking. The tidal locked moon is on the left. Now imagine you are back on Earth. Throughout the course of the day you can see the Moon move across the sky. That's because 24 hours is drastically shorter than 29.5 days. However, if you were standing on the Moon, the Earth would appear to stand still. Now, it would actually appear to wobble a bit because of the Moon's orbit's eccentricity, but it more or less stays in the same place. Here is an artistic yet scientifically accurate rendition of what it would look like. It's from Space Engine. Notice how the gas giant (the planet) wobbles a bit but stays in roughly the same place. It would look similar if you were on the Moon, but without the atmosphere, and the Earth would obviously be smaller and further away. Yes, the Earth would go through the same phases as the Moon. It would complete a cycle every 29.5 days because that is how long it takes for the Moon to orbit around the Earth. However, something different is that you would be able to see the Earth rotate, since it takes only 24 hours to rotate. When we look up at the Moon from Earth, as I said before, we cannot see it rotate because it is tidally locked, and thus only one side gets shown. Brightness depends on the phase, but generally the Earth is brighter from the Moon than the Moon is from the Earth because the Earth has a higher albedo (reflects more light) than the Moon, and the Earth appears larger from the Moon than the Moon appears from the Earth. The Moon takes up roughly 30 arcminutes of the sky, whereas the Earth takes up roughly 1 degree and 50 arcminutes. At full moon, the Moon has an apparent magnitude of roughly -12.75. At full earth, the Earth has an apparent magnitude of -16.75. That's about 40x brighter! 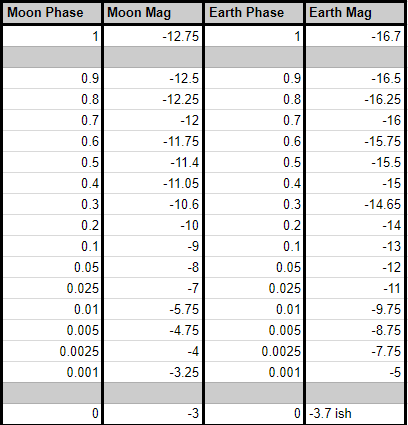 If we were to qualify phases as a % from 0% being a new moon to 100% being a full moon, then every 10% you go below 100%, the apparent magnitude of each phase decreases by about the same amount. For example: 90% Earth would be roughly -16.5 (+.25 magnitude), and 90% Moon would be roughly 15.5 (also +.25 magnitude). The differences in magnitude only get larger when you go below 10% phase, where each little bit of the celestial body that shows adds a lot more to the magnitude. Not the answer you're looking for? Browse other questions tagged orbit the-moon earth moon-phases visualization or ask your own question. During night on the Moon is there Earth light and Earth phases? Why is the moon phase not in sync with the moon's illuminated fraction?